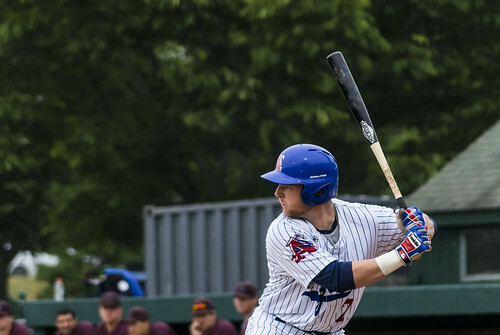 Following Tuesday’s loss, the Chatham Anglers (6-5-2) will return to the diamond on Wednesday to face the Wareham Gatemen (9-6) at 6:30 p.m. at Clem Spillane Field, marking the third meeting between the two sides this summer. The A’s opened their season with a 12-4 loss to the Gatemen on opening day at Veterans Field. Wareham led 5-4 going into the ninth frame, but used a seven-run inning, including a grand slam from Andrew Vaughn (California), to extend its lead beyond Chatham’s reach. On June 19, Vaughn’s first-inning long ball put the Gatemen up two, giving them a lead they never gave up. Wareham’s Ken Waldichuk (St. Mary’s) tossed five innings of one-hit ball, as the Anglers posted just four hits in total, their joint-lowest mark of the season. For the third time this season, the Anglers lost their first game after an off day, this time falling to the Falmouth Commodores, 4-2, in 11 innings Tuesday night at Veterans Field. With the defeat, the A’s have dropped two straight for the first time all summer. A second-inning solo shot from Tristin English (Georgia Tech) gave the A’s a 1-0 lead, which they carried into the ninth inning. Kyle Hurt (USC), who pitched four scoreless innings prior to the final frame, walked two batters and made a fielding error, enabling the Commodores to even the game at one. Kyle McCann's game-tying solo homer in the bottom of the ninth sent Tuesday's game to extra innings. After Falmouth tacked on another run, Kyle McCann (Georgia Tech) belted a game-tying solo home run to send the game to extra innings. Falmouth’s Maverick Handley (Stanford) hit the third long ball of the game, a two-run shot to give the visitors a 4-2 advantage. Hunter Gaddis (Georgia State) will make his first start of the summer on Wednesday. The right-hander has two relief appearances on the summer, both coming in shutout wins over Brewster on June 14 and June 20. Gaddis has been one of the A’s best arms this season. Davis Daniel (Auburn) and Dan Hammer (Pittsburgh) are the only other Chatham pitchers with at least four innings pitched and no runs allowed. Chatham’s Spencer Torkelson (Arizona State) and Wareham’s Vaughn, who are tied for the league’s lead in home runs (five), each departed their Cape League teams for Team USA. In the first two contests between the A’s and Gatemen this season, Vaughn tallied two home runs and six RBI to lead Wareham to two wins. Torkelson’s presence was missed in Chatham’s first game without him on Tuesday. Ben Ramirez (USC), who batted replaced Torkelson as the three-hitter, came to the plate with a runner in scoring position three times but did not produce a run.